School of HONK will take the party to our friends across the river, July 9, 12-2 pm, at the Sam Adams Brewery. We’re Looking For A Home! 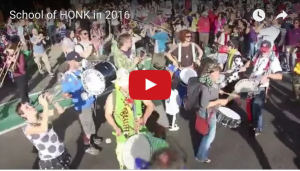 School of HONK is a free and open community music school, a 501(c)3 tax exempt organization, looking for a (big) place to make loud, joyful music (a la HONK! Festival) every Sunday afternoon 2 – 6 pm — somewhere near a public/commercial neighborhood with a built-in audience. We have limited means but can pay a weekly rental rate if we find the right place. Please read on! Join us on February 7th for School of HONK’s “Fat Sunday” Mardi Gras celebration! We will have an extended session on Sunday, from 3-7pm at First Church Somerville (89 College Ave). There’ll be music, there’ll be dancing, there’ll be gumbo… come enjoy the festivities, and bring friends! School of HONK’s online campaign went LIVE today. And just a few hours in, we’ve already raised more than 10% of our $5,000 goal, to help fund our 2016 plans, including afterschool, weeknight sectionals, and other additional opportunities to play. Check out Patrick Johnson’s great video, and our nifty perks for donors to our year end campaign. And please post on Facebook, forward this email to your friends and family, and shout it from the nearest available rooftop (if it’s safe)! Our very first meeting (at sprout) was October 26, 2014. Since then, we have met up to play together every single Sunday (and sometimes other days) since those humble but very promising beginnings. To celebrate, we went for an amazing parade to Crescent St in Cambridge, to help our neighbors really crank up the party. Tricks, treats and a lotta brass. Then we returned home for birthday cake, videos and memories of our first year passed. Those of us who traveled to HONK!TX have compiled pictures, videos, memories, and thank you’s to share with each other, the world, and our School of HONK bandmates who didn’t get to travel with us. On Tuesday, Sept 1 at 5 pm, School of HONK invites street musicians and performers to join us for a loud and proud musical parade from Central Square to Cambridge City Hall, to open a City Council committee meeting about busking and street performance policies, hosted by Councillor Nadeem Mazen. It’s a great opportunity to show our friends and neighbors and city officials what’s at stake in reclaiming and protecting the most public of spaces for street musicians and performers. We’ll congregate at 5 pm in Lafayette Square (south of Central Square T, across from the fire station). Please be advised that Councillor Mazen, Chair of the Neighborhood & Long Term Planning, Public Facilities, Arts & Celebration Committee, has scheduled a hearing for Tuesday, September 1, 2015 at 5:30 p.m. in the Sullivan Chamber, 795 Massachusetts Avenue. The purpose of this hearing to discuss the city’s street performance, artist coordination, and busking policies. The meeting will engage local and Greater Cambridge artists in conversation with a view to increasing opportunities for public performance, while decreasing any barriers to entry that currently exist. Musicians will also be giving brief performances to conclude the meeting. Aug 9, 2015: As part of Somerville SomerStreets “Seize The Summer” celebration, we launched our parade from Shaunalynn’s house, headed over to Highland Ave, met up with new friends who showed us how to play When The Saints Go Marching In, and closed out our show by summoning a real live Ghostbuster with our irresistible theme song. And our first newspaper photo, in the Somerville Journal (photo by Zack Declerck).